In the spirit of Christmas, and in what has become an annual tradition, cash awards and scholarships valued at more than B2 million were presented to deserving secondary students at the recent Wells Christmas Extravaganza held on the evening of Thursday, December 16. Twenty-five students from grades 6 to 12 were presented with Certificates of Achievement by members of the School Board of Directors, including Mr. Chang Yao-Lang (Chairman), Ms. Lee Mei-Chuan (Vice-Chair), Mr. Lin Yao-Tang, and Mr. Hou You-Wen. Also receiving scholarships were a second group of high achievers, the Wells Scholars. These students had attained a GPA of at least 3.5 in core subjects along with outstanding scores in at least six (6) different areas of the most recent SAT10. Wells Scholars receive tuition waivers of B20,000 per semester for the next two semesters. With an unprecedented number of league and tournament championships, several Wells athletes also received recognition from the School Board. Wells’ 2010 Fall Sports MVP Awards of B15,000 were presented to Kanwara “Kanny” Smith (U15s Girls Basketball & JV Girls Volleyball), and Yueh Ting “Kevin” Han (U15s Boys Basketball & JV Boys Volleyball). Outstanding Athletic Achievement Awards of B10,000 were presented to Jim Kao (Senior Boys Basketball & JV Boys Volleyball), Joon Young Lee (Senior Boys Basketball & JV Boys Volleyball), Tanapon “Boss” Phuripichet (Senior Boys Basketball), and Methaporn “May” Supa-Anan (Senior Girls Basketball). Congratulations to all award recipients! Photos of all of the recipients can be viewed on the Wells Facebook page. 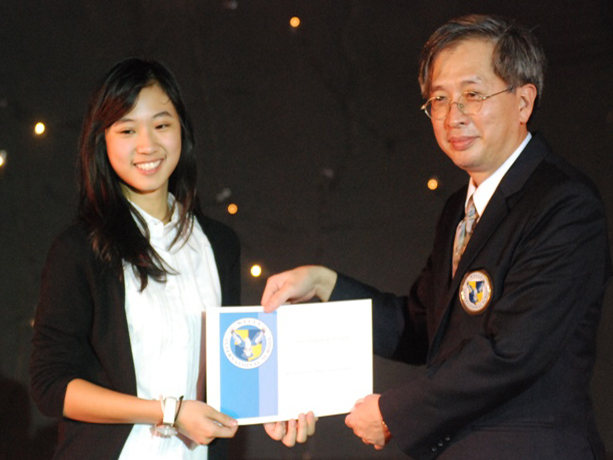 Chairman Yao-Lang Chang presents an Outstanding Athlete Award to Methaporn “May” Supa-Anan, Gr. 12.